The Celtics hosted the Pistons, winner of four-straight, at TD Garden Wednesday night in the tail end of a back-to-back. Once again, Boston was without Kyrie Irving or Aron Baynes, and Terry Rozier also joined the inactive list with an illness. Still, the shorthanded Celtics played an impressive game against Detroit and captured a 118-110 victory - the 12th win over their last 15 games. For the second night in a row, Al Horford had a huge impact on the game with his all-around great play, finishing with 17 points, 14 boards, and eight assists. Jayson Tatum (19pts/4reb/4ast) and Gordon Hayward (18pts/5reb/8ast) led an awesome supporting cast for Boston in the win. If the Celtics had any fatigue to start this back-to-back game, they didn't show it. The green scored the first four baskets of the night led by Hayward, who was inserted back into the starting lineup with Irving and Rozier on the shelf. The hot start didn't last long. After starting the game 0-3 from the field and quickly down by eight points, the Pistons proceeded to hit 10 of their next 13 shots to spark a 24-5 run. Boston's offense went dark during this time, as the lineup struggled to hit shots. Blake Griffin torched the Celts, dropping 13 first-quarter points while shooting 5/6 from the field and 3/4 from deep. A Semi Ojeleye corner three (where else would he be?) snapped the Detroit scoring burst and brought some life back to the Celtics offense. Horford was fantastic in the 1Q and registered 8 points, 4 rebounds, and 3 assists to right the ship for Boston and bring them to within a point. Jaylen Brown did a great job attacking the rim for the Celtics. The 22-year-old had eight points in the quarter and 10 in the half off the bench. Meanwhile, the Pistons had minimal support from their second unit. Their bench went scoreless in Q1 and only scored two field goals in the whole half, getting outscored 25-8 by Brown (10), Ojeleye (8), Brad Wanamaker (5), and Daniel Theis (2). Ojeleye went on to have a perfect half of play with eight points on 3/3 shooting. Motorcity got a boost once Griffin returned to the floor, as the All-Star scored another seven points on more effective shooting. If it weren't for this, the Celtics could've established a greater lead at the half, but still held onto a five-point advantage. Boston's third-quarter struggles were no concern tonight. They shot a hair under 50% from the field and continued utilizing a balanced scoring attack to build on their lead. Tatum and Marcus Morris led the way in scoring for the green. That being said, it was by no means good basketball. The 3Q was quite ugly as a whole, largely due to the alarming rise in foul calls. After the Celtics and Pistons were each charged with seven fouls in the first half, they were called with nine and six fouls in the 3Q, respectively. The Celts - a great team at taking care of the ball - also turned it over four times. But when games get ugly, you can always count on Marcus Smart to scrap his way to some production. Smart miraculously hit three treys in a row to stretch Boston's lead to 17 - all coming after a slump in which he had missed TWENTY straight three-pointers. 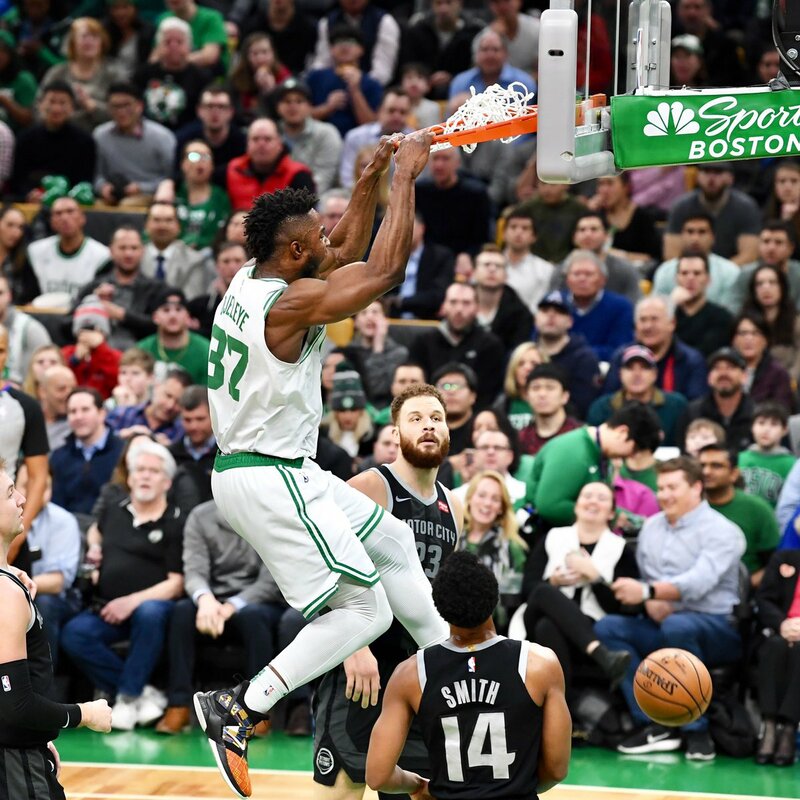 Smart poured in 14 of his 16 points in the third quarter to help the Celts overcome an odd 12 minutes of play and take a comfortable 19-point lead into the fourth. The Celtics were coasting in the final quarter, extending their lead even further to 28...yup, a 28-point lead. Sound familiar? Well, Boston started coasting a bit too much and got extremely sloppy with the ball, allowing the Pistons to explode for a 20-2 run. This brought them all the way back to within 10 points. Al Horford was too much for Detroit, though. The big man continued to come up big, adding nine points to his scoring total and preserving Boston's diminished lead.